Mischa Hillesum was raised in an unconventional environment in Deventer. In the family home, certainly not typically Dutch with its exotic interior and bohemian atmosphere, all attention was given to intellectual and cultural matters. Just three years of age, he amazed everyone with his piano playing. His small hands raced over the keys, and if he couldn't reach far enough, he used his elbows. Sometimes he sat down on the floor, playing with his hands above his head. It was his way to prove that the piano was an extension of his body. It all sounded equally brilliant. With these antics he charmed everyone. At age eleven he had, regarding music, outgrown Deventer and in the summer of 1932 moved to a foster home Amsterdam. The impact of the separation from his parents was somewhat eased because his sister Etty was already living in Amsterdam. 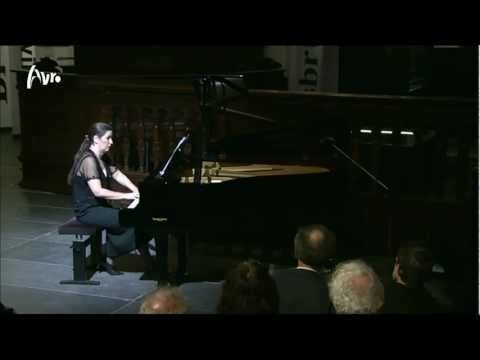 According to George van Renesse, a teacher at the Amsterdam Conservatory, Mischa was at age thirteen beyond the level of the final examination. He could at most, improve on his technique and have some lessons in music theory. Moreover, there is no trace of him in the conservatory archives. Maybe he was a guest student, following customized lessons. He evolved into a remarkable personality, sometimes stunning his teachers with strange antics. Once he pretended to conduct a symphony orchestra. He was completely carried away and exhausted, as if in a trance, climbed off the empty concert podium of an empty concert hall. Mischa was seventeen when he gave a recital in the Bach Hall in 1938. He played as if possessed by an otherworldly power which guided him through the concert. It was compelling, animated and electrifying. But after the concert a bell jar descended upon him. He earned a standing ovation, but the thunderous applause only enlarged the distance between himself and the audience. Next to the grand piano he stared like a robot at the public and responded to the applause with jerky mechanical bows. The recital had taken its toll, he had ended up in the unbridled depth of his mind. The following day, he was sent to a large Jewish psychiatric institution for the mentally ill, the Apeldoornsche Bosch, in the forests of the Veluwe. After his discharge from the hospital, he was occasionally booked for concerts; modest, and mostly in private homes. His parents, as his biggest fans, crossed the entire country with Mischa, always sitting on the front row not to miss a note. Audiences and especially women, were ecstatic. According to experts you'd only need to hear a few measures to realize how talented he was. He knew how to bring out the beauty of a composition, allowing the melody to flourish and recreating a piece like no one else. He played unaffectedly and completely natural; remarkably low on his piano stool – like the famous Bach interpreter Glenn Gould later - almost hidden behind the instrument, erasing himself, trying to achieve an interpretation in the spirit of the composer, without shallow technical features. Beethoven, Schubert and Mozart were his preferred composers, but he also liked Rachmaninov, Scriabin and Mussorgsky; Chopin was undoubtedly his favorite; the Polonaise A-dur opus 40 No.1, the first part of the Sonata no.2 opus 35 and the Marche Funèbre were regular pieces on his programs. Hillesum had an affair with Mien Kuyper, many years his senior. She was a music teacher living in the southern district in Amsterdam and she encouraged him to compose. He liked working on his compositions at her red lacquered grand piano. His only preserved compositions were discovered in Mien Kuyper’s estate. These are the two Preludes for Piano, completed in March 1939 and in February 1940. Musicologist Leo Samama describes these preludes as confident and true examples of pianistic virtuosity, and appears effortlessly written down. Mischa's last surviving work dates from 1942. In that year, the persecution of the Jewish population was intensified, and although Mischa had never shown any affiliation with the Jewish culture, he was now inspired to make an arrangement of Fantasie van Joodse Melodieën (Fantasy of Jewish Melodies) by the Jewish composer Maurice Samehtini. The instrumentation for klezmer ensemble is typical of functional music for Jewish weddings and other celebrations. During the occupation, he often played in Amsterdam on the so-called “black nights.” As of September 15, 1941, Jewish artists were prohibited from performing publicly and had to rely, more or less, on clandestine concerts and theatre plays in private homes. The guests made financial contributions to support the unemployed artists. Etty wrote several times in her now famous diary about those evenings. On many occasions she dreaded these recitals, overwhelmed by feelings of despair and pity. “My little brother,” she thought. “Poor boy, what's the use of your brilliant playing for a sensation hungry audience, when your face is so clearly contorted with suffering.” Etty couldn't enjoy the music, because she was constantly wondering what was going on in his mind. Noticing the talent of his young patient, the doctor moved his grand piano to the recreation room of the clinic. And Mischa began playing terribly difficult works with great ease; never before had Spanjaard heard such a phenomenal pianist. It is obvious that Mischa fled reality by making music, or music was simply his reality. The way in which every day life was experienced by others, was incomprehensible, strange and even repulsive to him. 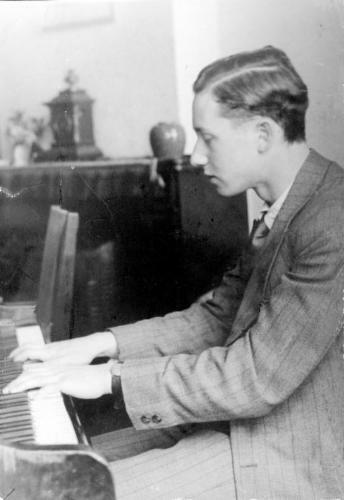 He only felt comfortable at the piano and tried to forget the misery of war by making music. Es wäre meines Erachtens wünschenswert, wenn die grosse Begabung dieses jungen Pianisten dem holländischen Kulturleben erhalten bleiben könnte. Ich würde mich freuen, wenn Sie, sehr geehrter Herr Generalleutnant, den jungen Hillesum als Ausnahmefall betrachten und ihm nach Möglichkeit helfen wollten. Several freight trains with more than five thousand people, including the Hillesums, left for Westerbork on the evening of Sunday, June 20th, 1943, and also the following night. Mischa, didn't want to be an exception; he refused any privileges or protection. He just wanted to remain close to his parents. On September 7, 1943, the family Hillesum was transported from Westerbork to Auschwitz. After arriving, his parents were immediately murdered; Etty remained alive for a few weeks. Mischa was sent to Warsaw, where he had to clean up the debris from the ghetto. He died, according to the Red Cross, sometime between October 8, 1943 and March 31, 1944.